My career started in mental health nursing and I have in excess of 10 years’ experience working in this field. I recently completed my Post Graduate Diploma in Counselling and Psychotherapy. I am currently working on my accreditation with UK Association for Humanistic Psychology Practitioners (UKAHPP) which will lead to accreditation with UKCP. Using a Humanistic integrative approach I believe in helping the client realise their true potential by focussing on integrating body, mind, emotion and spirit. Whilst working as a Mental Health Nurse I developed a vast array of diverse skills which I often draw upon in counselling and psychotherapy. I believe that every person is unique and effective psychotherapy is a journey which both the client and the therapist undertake together. I am a firm believer that everybody wants to be accepted. 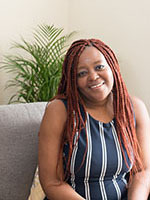 As your counsellor I will endeavour to create a space that encourages acceptance in an environment that is empathic, non-judgemental, that fosters a positive unconditional regard and understanding.